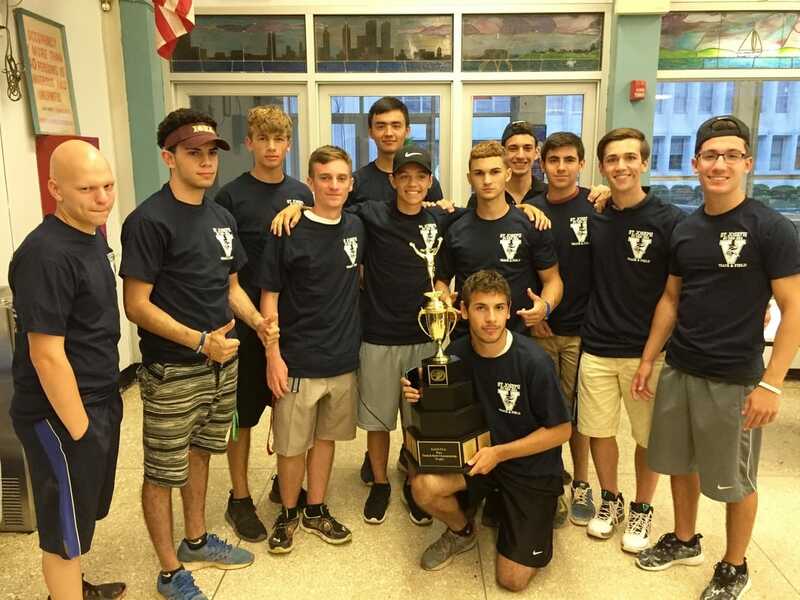 6/5 - Eastern State Champs - Iona Prep H.S. 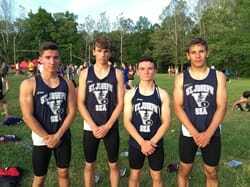 The Varsity 4x1600 wins the Eastern State Championship 4x1600 and crushes the school record of 18:46.1 from 1992! 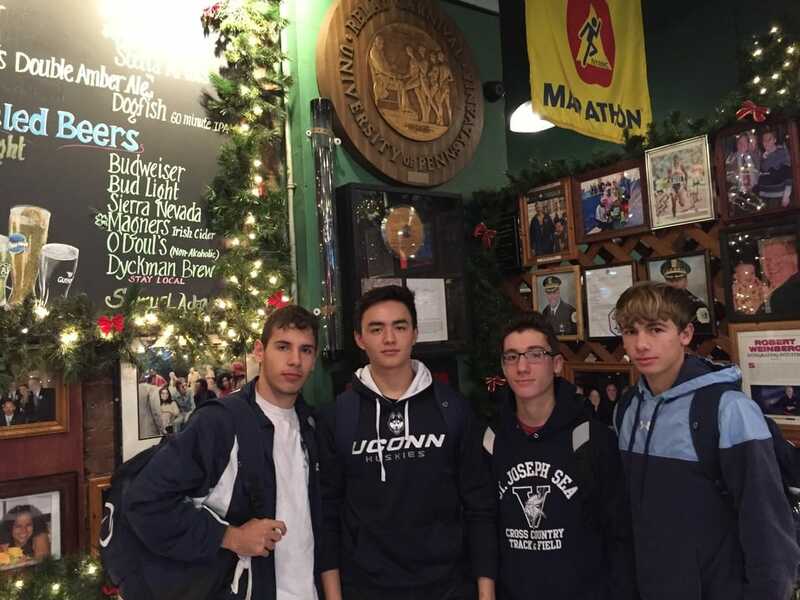 Robbie Guidicipietro (4:26.7), Rob Ruspantini (4:42.2), Michael Kieran (4:40.7) and Nick Velez (4:14.8) combine to run 18:04.41 FAT. Velez's 4:14.8 is the fastest 1600 or mile ever run by a Sea athlete. His splits: 60.4 - 64.9 - 65.8 - 63.7. Junior Mike Matrangolo jumps a PR of 22'-0 in the long jump for 3rd place. 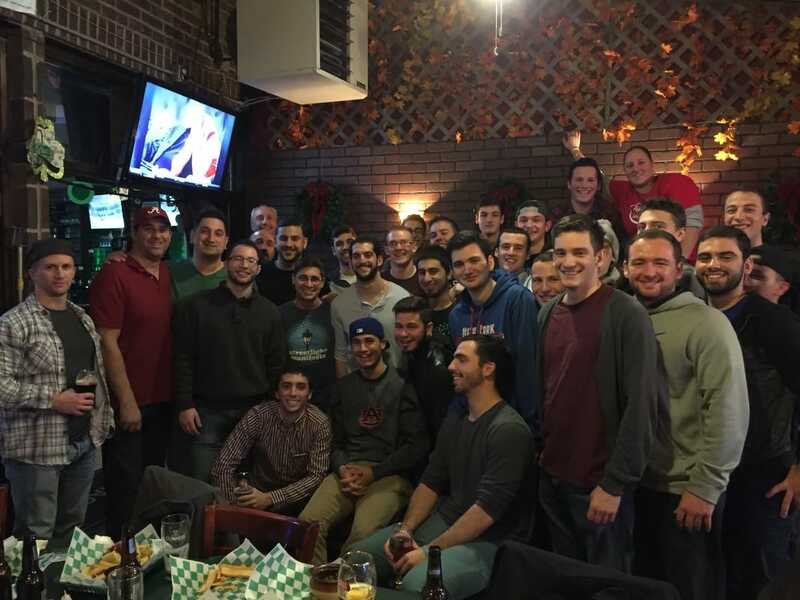 Matrangolo went from 18'-11" to 22'-0" in his first full season on the team. 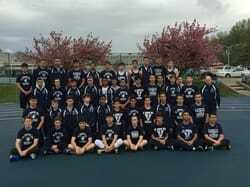 5/31 - Fast Times Relays - Warwick Valley H.S. The Fast Times tradition continues as the Varsity 4x800 posts a seasonal best of 7:54.08 FAT which earned them 4th place medals. Robbie Guidicipietro (1:57.6), Mike Kieran (2:02.6) and Nick Velez (1:52.5) set PR's. The Frosh 4x800 runs 9:03.69 FAT to just miss breaking the freshmen record. Michael DiBiase adds another Catholic State plaque to his collection by winning with a 6'-2" jump. Junior Michael Matrangolo keeps his hot jumping going while leaping 21'-6 1/2" which earned him a 3rd place medal. 5/24 - Frosh Islands - St. Joseph Sea H.S. The freshmen team finishes in second place while scoring over 100 points. Nick Masters wins the Frosh S.I. 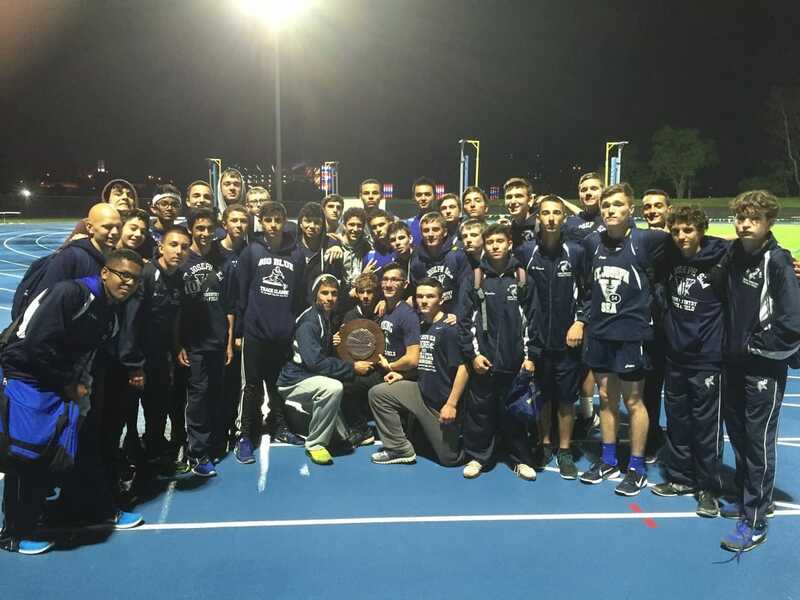 title and did so by breaking the school record previously held by Adam Civitano '11. Steven Anzalone wins the 800 meters after taking 2nd in the 400 IH. Ryan Simermeyer (HJ) and Christian Attardi (Javelin) also win their specialties. The team has its best complete team performance on the season with many stellar performances. John Cambio wins his first sectional title in the 400 IH. Robbie Guidicipietro breaks the school record in the 3,200. 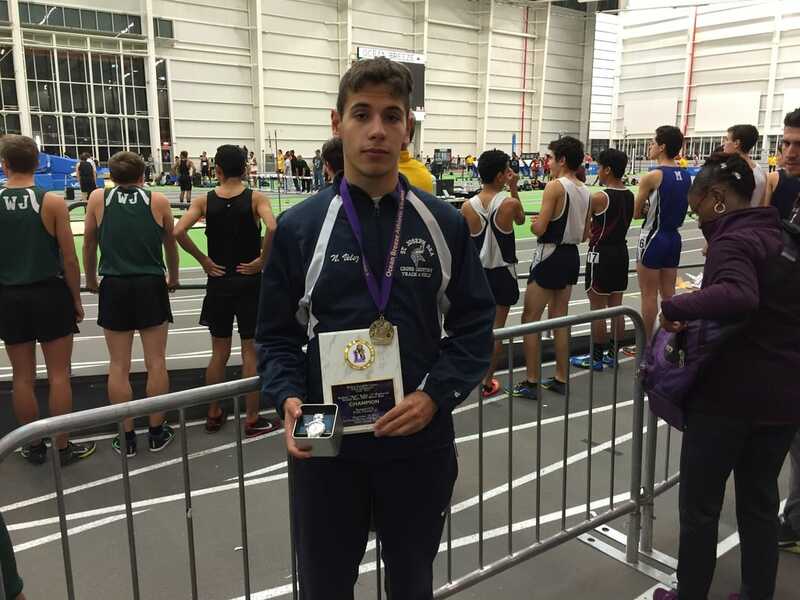 Nick Velez wins the NYC and NY Sectional title in the 800 meters. 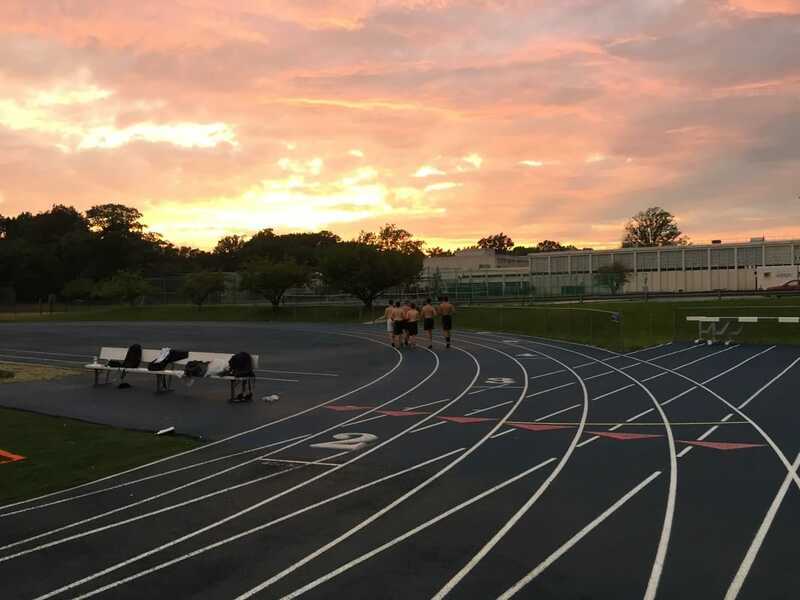 In the 4x800, with a few of the stadium lights out, and only 1 hour after his first race, Velez would duel with Xavier's anchor leg for the last 300 meters as he scorched the track for big PR, 1:52.9 anchor leg. 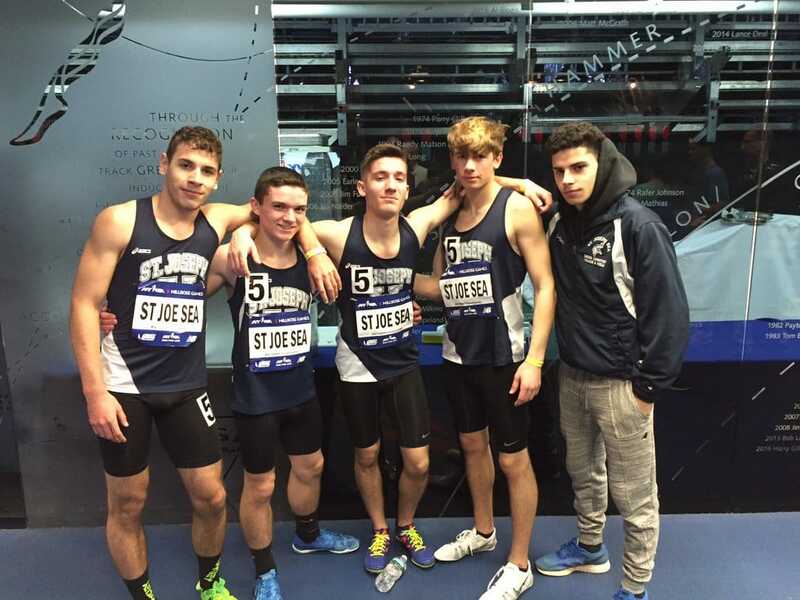 The team of Ruspantini, Guidicipietro, Kieran and Velez would run 8:02.57 FAT for a fine second palce finish. 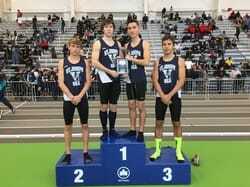 mike DiBiase wins the NYC and NY Sectional titles in the high jump as Joe Cottone places 2nd. 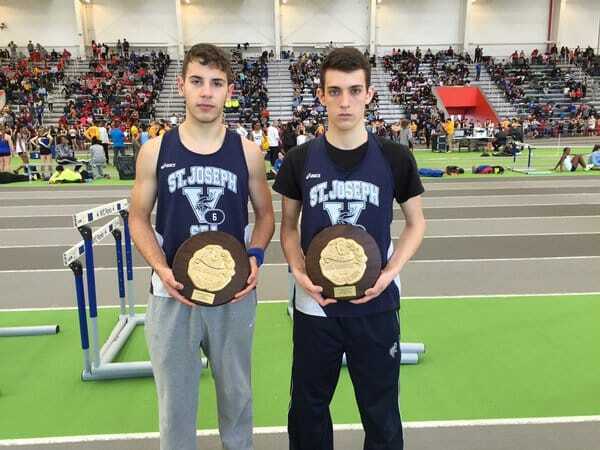 Junior Michael Matrangolo wins the NYC & NY Sectional titles in the long jump while James Mahoney placed 2nd. Both jumpers went over 20 feet. Steven Anzalone wins the Frosh Catholic State Championship in the 400 IH in a personal best of 62.59 FAT. Christian Attardi takes 2nd in both the discus and javelin. 5/13- 5/14 - Louck's Games - White Plains H.S. Velez runs 1:55.60 FAT through torrential downpours and places 5th. 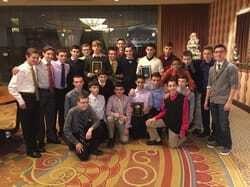 5/6-5/7 - Staten Island Champions - St. Joseph Sea H.S. The action got started quickly for the Vikings on Day One as John Cambio led a 2-3-4 finish in the 400 IH. Robbie Guidicipietro continued the momentum by winning the 3000 steeplechase for the second year in a row. At the end of Day 1, it was Sea 29, MSIT 19, Wagner 10. The 4x100 kicks things off on Friday morning with a season best of 45.22 FAT on the tricky wide turns of Franklin Field. They placed 8th in thir heat. The 4x400 runs 3:30.54 FAT and is the top island team. Guidicipietro (52.2) and Cambio (51.8) run PR's. MONSTER DAY AT BIG BLUE! 4/23 - Big Blue Track & Field Classic - St. Joseph Sea H.S. The freshmen get things kicked off in the first event of the day with a 4th place finish in the Frosh SMR with a very solid time of 4:03.08 FAT. The Varsity 4x100 finishes in 3rd with a season best of 45.24 in the Championship 4x100. Senior Nick Velez wins the Invitational 800 with a blazing 1:55.32 FAT. He would come back and team with Robbie Guidicipietro, John Cambio & James Mahoney to win the Championship SMR. The Varsity 4x800 earns silver medals. Michael DiBiase continues his winning ways by taking the high jump. Junior Mike Matrangolo goes over 20 feet for the first time. The Varsity 4x1600 places 2nd in the Invitational race while running 18:50.6; #2 in school history. Freshmen Steven Anzalone opens up in the 400 IH in a solid 64.5. Chilly temperatures and rainy conditions were no issue for the team as we win our first Mayor's Cup Championship. Mike DiBiase wins the high jump and the pole vault. 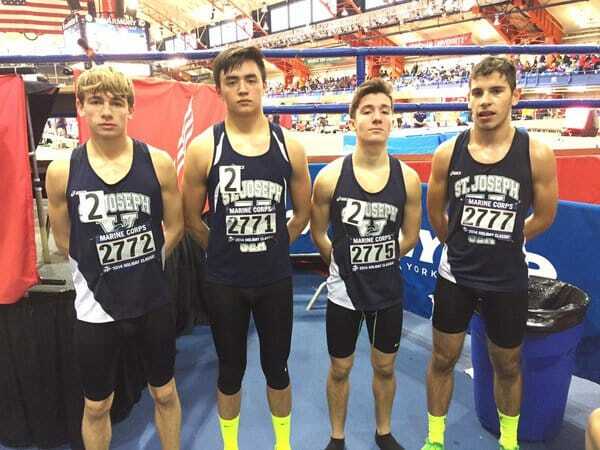 The Varsity 4x800 turns back a challenge from Archbishop Molloy. Mike Matrangolo wins the triple jump and the freshmen turn in a nice 4x800 time of 9:18.0. 4/1 - Farrell vs Sea Dual Meet - Farrell H.S. Both teams battle the delays due to the thunderstorms and get in some good competition in a nice rivalry to kick off the outdoor season. The Varsity 4x800 qualifies to run the "Championship" section of the 4x800 and despite the sub par effort; doesn't take away from the excellent season the foursome put together this year. Mike DiBiase (9th - 6'-0") competes in the high jump and Nick Velez (21st - 2:37.87) runs the 1,000 to represent Sea up at Cornell University. The Varsity DMR lowers the school record to 10:28.17 FAT. 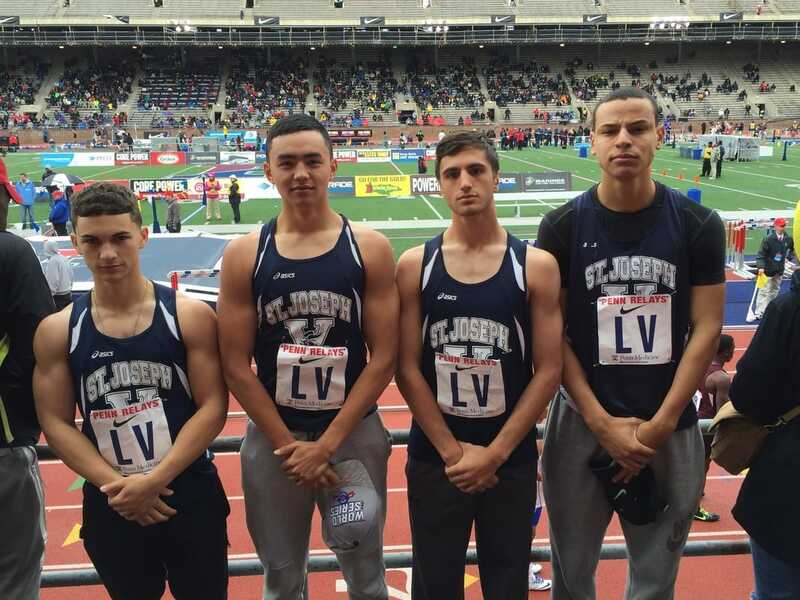 Velez (3:10.9 - PR), Cambio (52.9 - PR), Ruspantini (2:00.4) and Guidicipietro (4:23.8 - PR) comprise the relay. Soph Mike Kieran places 2nd in the 1000 meters. Frosh Nick Masters breaks Kieran's year old frosh record in the 1000 en route to a 3rd place medal. The Frosh 4x400 runs a spirited race to close the meet to take 2nd place. Nick Velez shocks nationally ranked Conor Lundy of Fordham Prep in the 800 meters to win the Sectional title. His 1:54.49 breaks our school record and the overall meet record. By virtue of his 800, and silver medal in the 1600, he wins the Track MVP. Rob Ruspantini wins a Sectional Championship in the 1000 meters. Mike DiBiase wins a Sectional and NYC Championship in the HJ. After a few hours of our big team win, the freshmen head to Ocean Breeze and demolish the Frosh DMR record by 18 seconds. 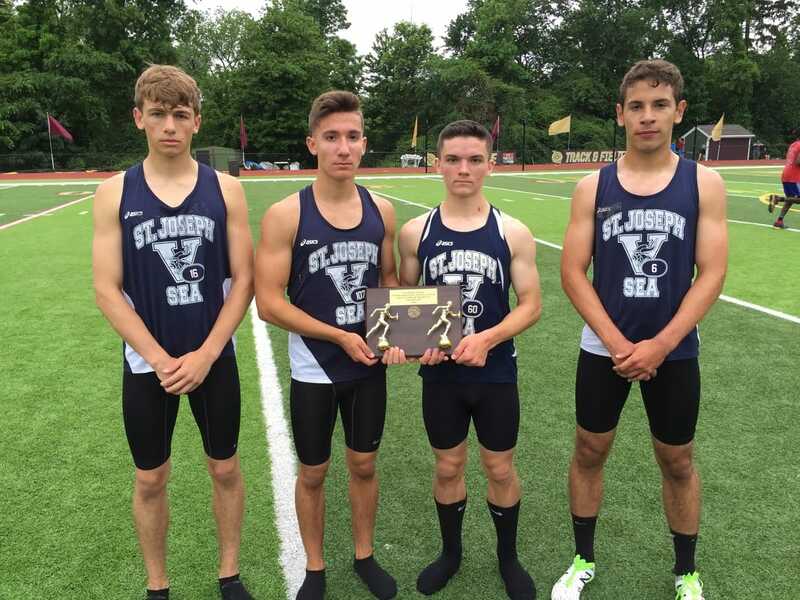 Steven Anzalone (2:13.5), Hudson Scanni (27.4), Patrick Perry (60.4) and Nick Masters (5:14.2) smash the record and win a Sectional Championship by virtue of their first place finish. Viking 4x800 qualifies for Millrose for the 10th time! Nick Velez (2nd) and Robbie Guidicipietro (4th) place in the 1600 meters. The team gets a few things needed for the SI Champs next week. 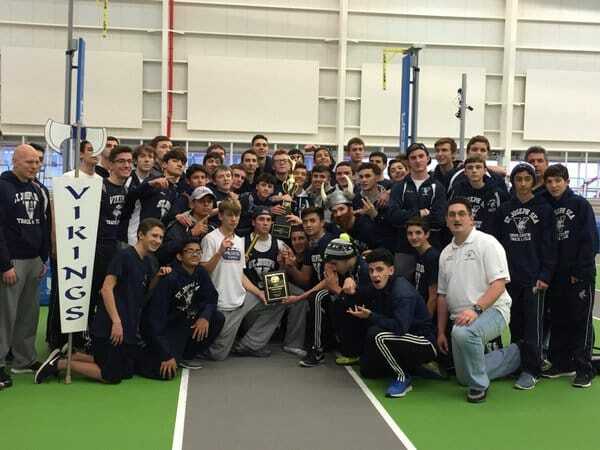 The weight men capture the CHSAA Weight Championships! Tons of medals and PR's for the Vikings in the first meet of the new year! In the first big relay meet of the season, the Varsity DMR takes 2nd in the Invitational race. The time, 10:28.45 breaks a school record from 1997! 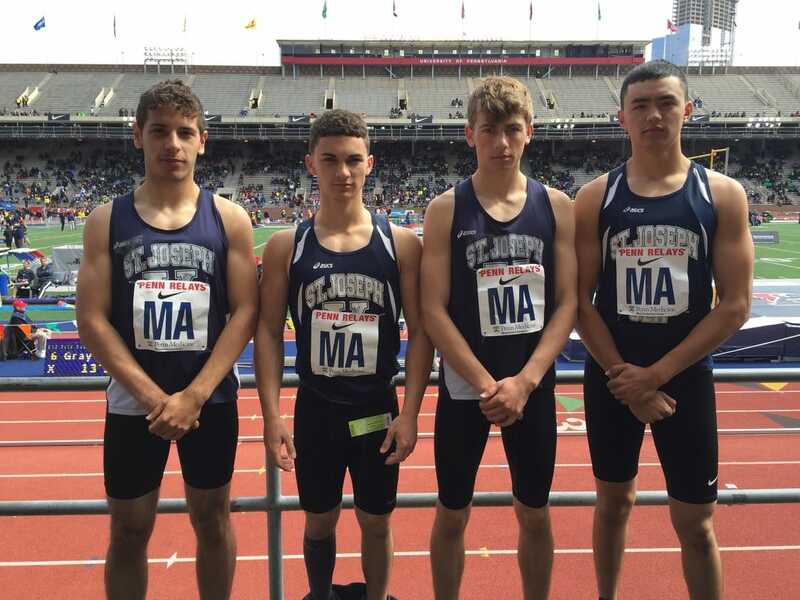 The relay is currently ranked #2 in the U.S. and #1 in NY State. The team works off some holiday food in a tune-up meet. 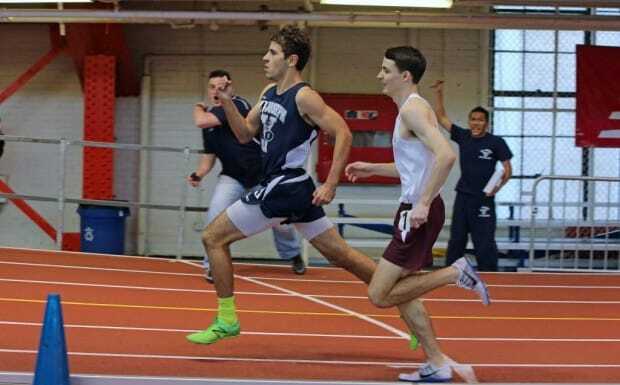 Nick Velez wins the Loughlin Games 1000 despite a clerking eror that placed him in the 3rd heat. The Varsity 4x800 gets a major first test down with a solid winning time of 8:07.21 FAT which should secure the team one of the 8 spots in the seeded section at the Millrose Trials! The team scores in all weight class events as well as the Varsity LJ Relay, Varsity HJ Relay and Varsity SHR. A good meet across all levels. 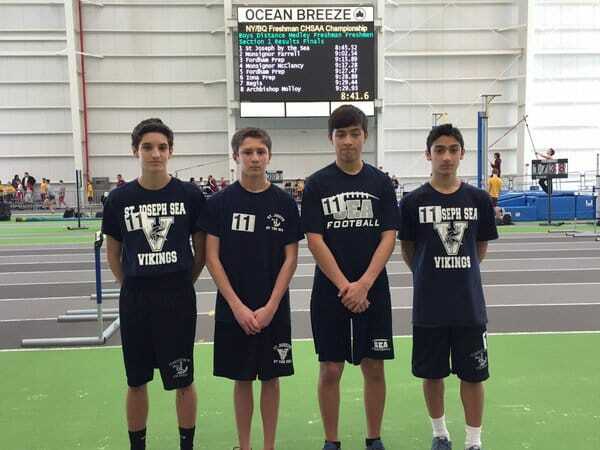 The Varsity DMR wins the first ever track event contested in the Ocean Breeze Track & Field Center. 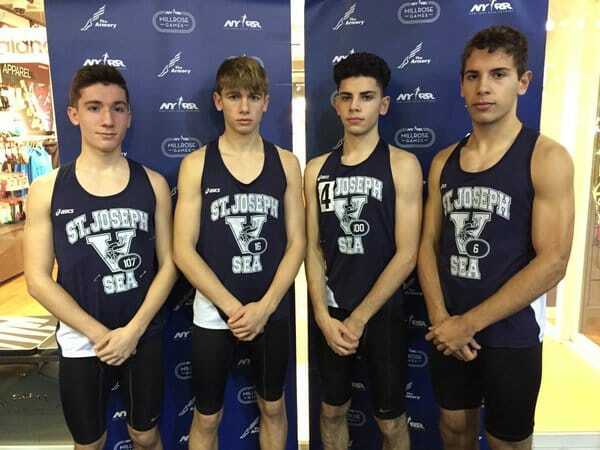 Robbie Guidicipietro, Joe Somma, Rob Ruspantini & Nick Velez make Sea and Staten Island history! Robbie Guidicipietro just misses out on a S.I. title losing in a 200 yard sprint at the finish. 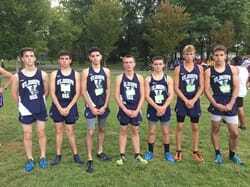 Nick Velez runs a big race to take 4th overall and soph Michael Kieran breaks into the top 15. The Varsity finishes in 3rd place earning a team plaque squeaking by Curtis & Wagner. Frosh Hudson Scanni paces the JV team to a 3rd place finish. Robbie Guidicipietro ends a spectacular season with yet another school course record, his 4th this year, with a 16:41 time over the 5K course. His time crushes the previous record of 17:15 held by Frank Recce 2005. 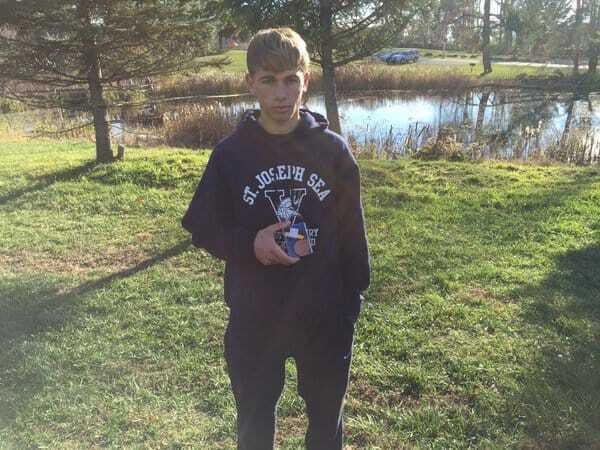 He also becomes the first Viking to earn a state medal by virtue of his 33rd place performance. 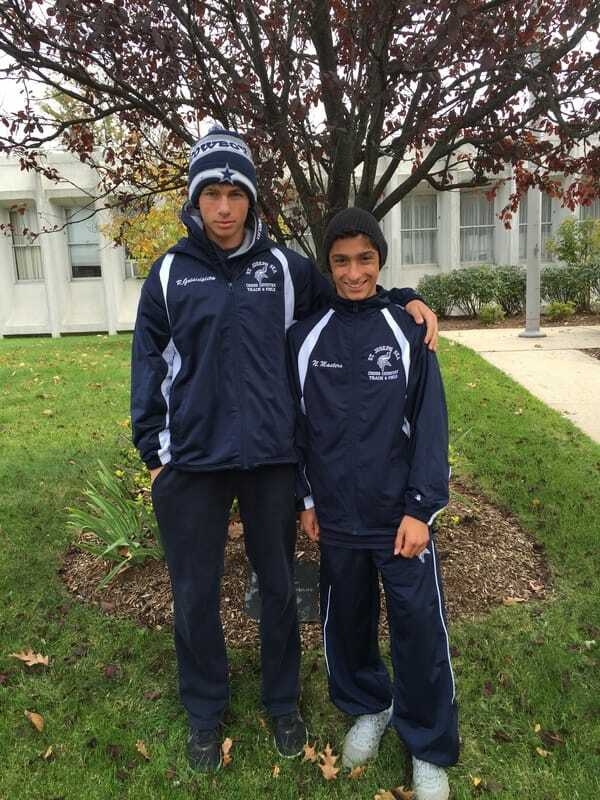 Guidicipietro and Velez qualify for the NY State Champs for the 2nd year in a row. The freshmen put up a valiant effort and come within 5 points off pulling off a major upset. 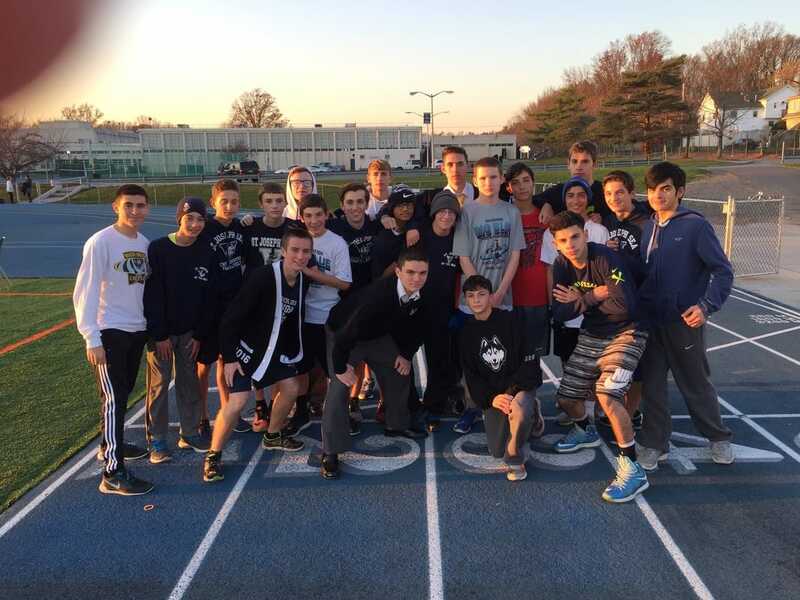 The team, which lost to Farrell by almost 50 points at the first meet of the year comes in 2nd, losing to only MSIT. We place 4 runners in the top 10 but fall just short. Such a great effort on the day. The Frosh "B" team finishes in 2nd place as well. Soph Michael Kieran runs a PR of 14:07 for 9th place in the Soph race. His time is currently #3 SO AT. 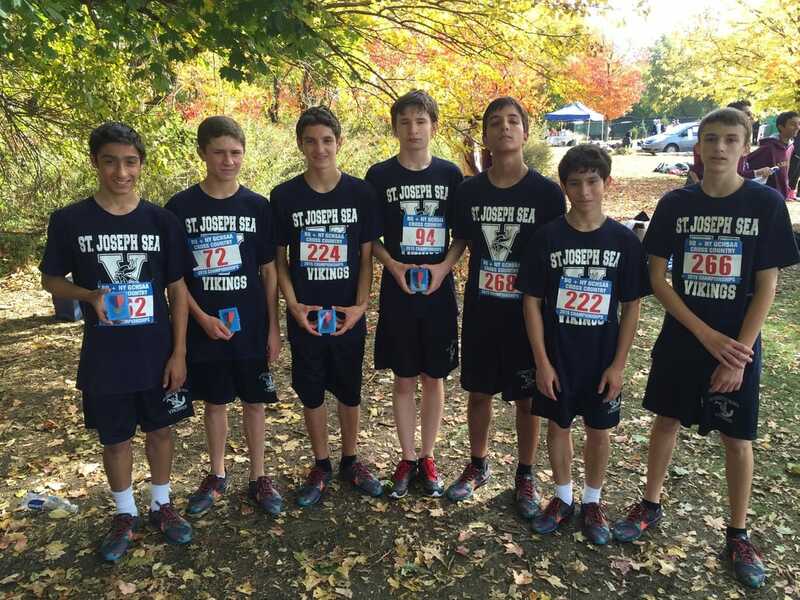 Hudson Scanni (8 secs) and Steven Anzalone (3 secs) set PR's on the Frosh "A" squad. 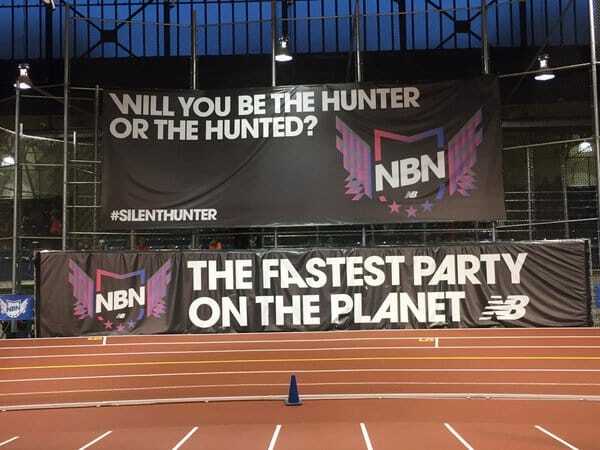 Ken Dias sets a monster PR on the "B" team knocking off 3:48 secs. The Frosh "A" and "B" teams finish in 7th place. 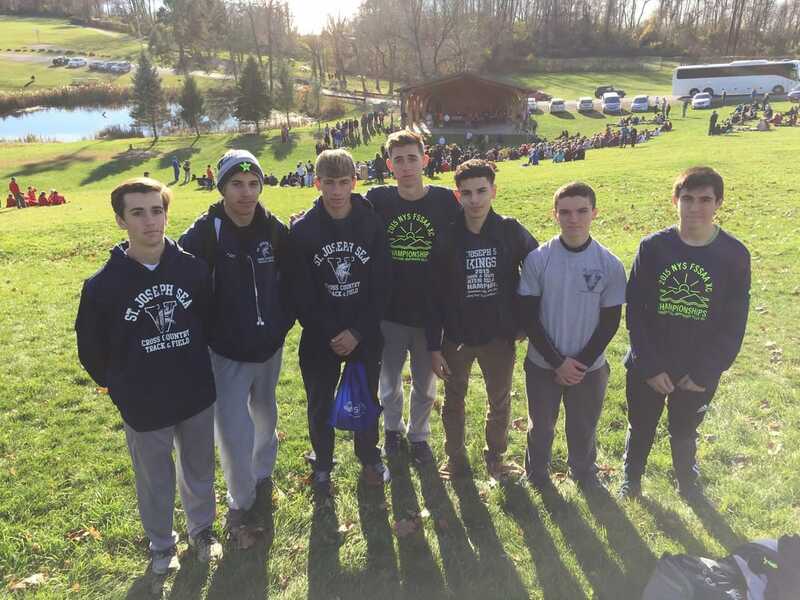 The freshmen again continue their hot running just missing a 3rd place plaque by a few points. Nick Masters becomes the 2nd freshmen to ever break 9 minutes over the VCP frosh course running 8:57.58. 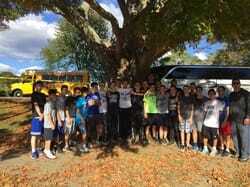 Big PR's on the day as the Frosh "A" team averages a 40 second PR per man. 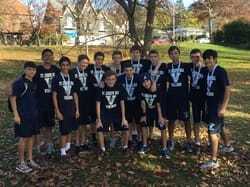 Not to be outdone, the Frosh "B" team places 2nd in their race beating out Xavier & Farrell. Newcomer Dom Palermo paces the "B" team. In the varsity, Nick Velez runs a 20 second PR of 13:31 which is #6 ALL-TIME. Senior Mike Cardona PR's by 33 seconds to run 14:44. Guidicipietro becomes the first to break 13 mins! 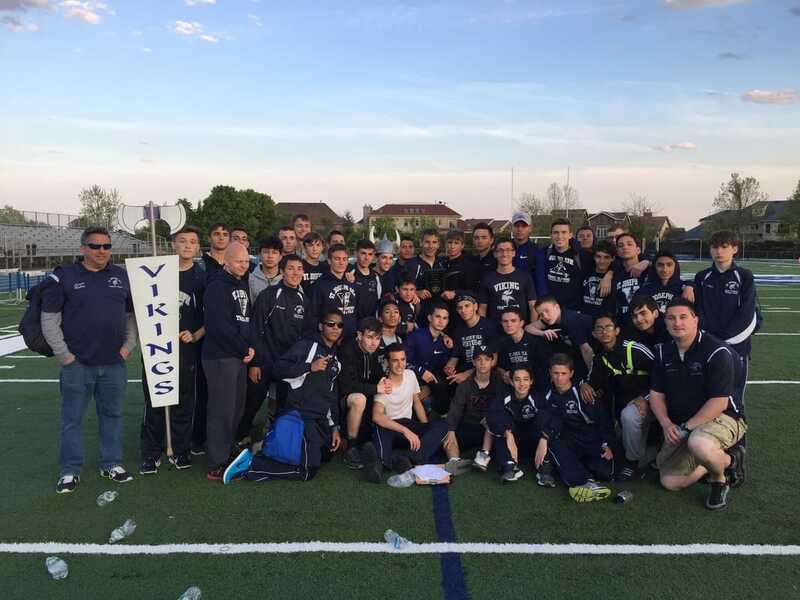 ​Senior Robbie Guidicipietro is the first Viking to ever break the 13 minute barrier. 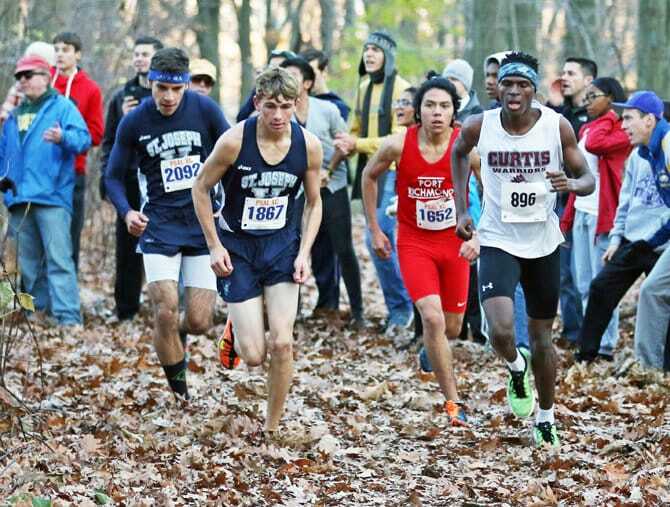 His 12:54.5 is the 18th fastest in Staten Island history! Velez drops a few seconds to a 13:51 seasonal best. Robbie Guidicipietro wins the Varsity race for the 2nd year in a row. 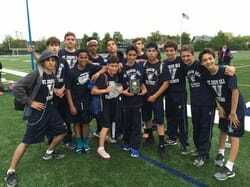 The team finishes 1 point of a 3rd place plaque. 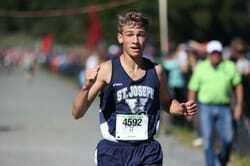 Guidicipietro runs 13:31 for his season opener at VCP which is #5 on the all-time list. 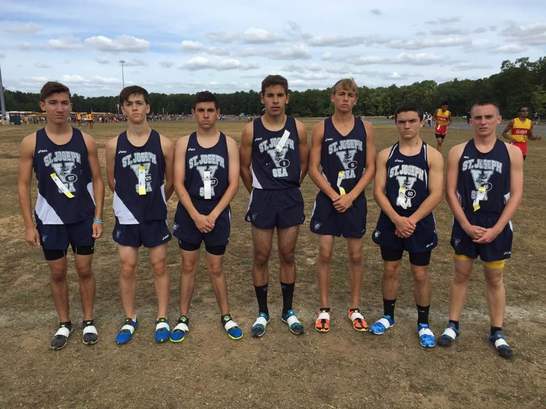 The freshmen are solid in their VCP debuts. XC '15 gets kicked off in a meet named in honor of one of our fallen captains!